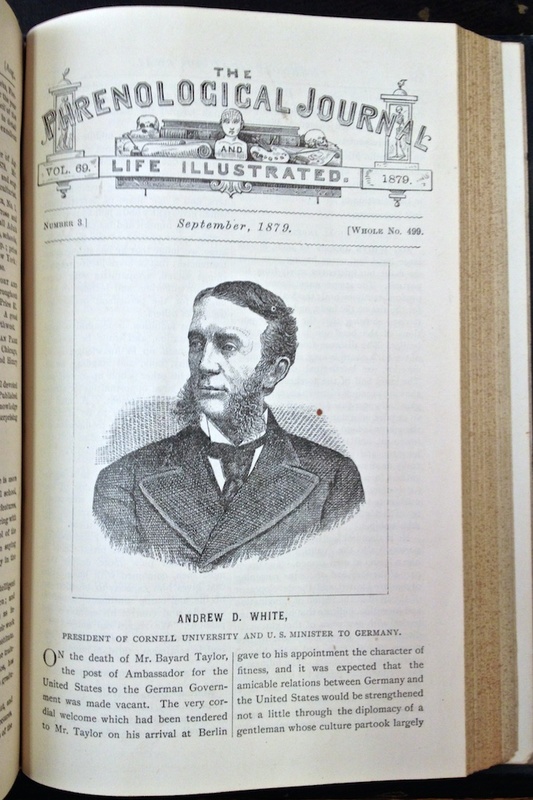 Prompted by Dr. Crabtree’s recent efforts to revive head size as a meaningful indicator of intelligence, I offer the following phrenological evaluation of Andrew White straight from the pages of The Phrenological Journal and Life Illustrated . White is best known today for his polemical The Warfare of Science and Religion , which regrettably continues to structure much of the discussion about the relationship between science and religion. Despite errors and oversimplifications, White’s versions of various historical episodes are repeated today as gospel. 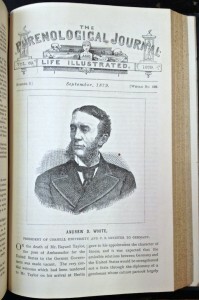 White’s appointment as ambassador to Germany motivated the editors of The Phrenological Journal and Life Illustrated to assess White’s character and his likelihood of advancing the diplomatic relationship between Germany and the U.S. Fortunately, at least from the editors’ perspective, White seemed an excellent appointment whose abilities would bring the two countries closer together. The temperament seems to be predominantly mental; the brain is large for the size of the body, and it widens as it rises, showing that the superior portions of the head are larger than the basilar. The distance from the opening of the ear forward is long, showing ample anterior, or intellectual development. The lower half of the forehead is large, showing keenness of criticism, capacity to gain and appreciate facts, and the ability to acquire information for himself; and though he is fond of natural science and literature, and has a natural talent for business and business affairs, he has really more capacity for pushing investigations, for making discoveries in science, for comprehending remote causes with relation to truth, than for the mere matter of fact which pertains to business or scholarship. After White received his B.A. from Yale he travelled Europe for two years. He returned to Yale for a year before being appointed chair of History and English at Michigan University. There he singlehandedly elevated the institution to a level of prosperity. His labors were so arduous that his health declined to the point where he “was obliged to resign his professorship and travel in Europe for six months.” (Oh to have such health problems and the financial means to find such a cure). As a state legislator in New York he was instrumental in establishing Cornell University in 1865 and, the following year, was appointed its first president. He promptly returned to Europe, ostensibly to examine the leading institutions of agriculture and technology. The editors regretted that he had not had sufficient time to publish much but had at least written a few articles and a recent book. His book, The Warfare of Science and Religion they seem to damn with faint praise: “The recent volume, entitled “The Warfare of Science and Religion,” was written, we presume, mainly in answer to the many utterances which had appeared on the side of science as against revelation, but, while its reasoning is scholarly and powerful, it is not extended enough to be exhaustive.” He was, apparently in their estimation, a better speaker. They lauded his oral addresses, such as his inaugural speech at Cornell University.